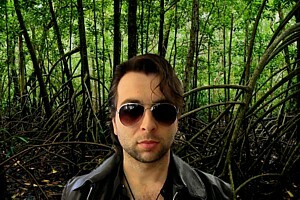 Count Belfiore (Christopher Busietta) in the mangrove garden. La Finta Giardiniera is an opera buffa (comic opera) written by Wolfgang Amadeus Mozart in January 1775 when he was just 18 years old. The libretto is said to have been written by Giuseppe Petrosellini, although according to Wikipedia this is disputed. The great strength of this opera lies in the wonderful music written by a youthful Mozart. A lot of the music seems to point towards the direction of Le Nozze di Figaro, especially in the very expansive ensemble numbers. It is a joy to listen to – and also a joy to sing! Video shooting for La Finta Giardiniera. The story of La Finta Giardiniera is about tangled love. The “Pretend Gardener” is Violante, a noblewoman, who is disguised as a gardener called Sandrina. She is working for the mayor (Il Podestà in Italian) of the town she has fled to. She is disguised, because she has fled home after being stabbed by an ex-lover, Count Belfiore. Despite this, she still means to find him. Count Belfiore is, meanwhile, travelling to the town and is arranged to be married with Arminda, the mayor’s niece, before he unexpectedly runs into "Sandrina" and recognizes her. Basically every character, with the exception of the two core characters Sandrina (the pretend gardener) & Count Belfiore, are in love with somebody who is not in love with them. The main themes are therefore about the despair and frustration of pining for somebody who isn’t interested. In the end, the tangled threads even out and the characters mostly end up in happy pairs. The diagram below shows who is in love with whom. SPOILER ALERT: Put your mouse over the image below to see which characters end up together at the end of the opera. The role of the Count Belfiore (which I am playing) is a bit of a riddle. Despite being a nobleman with a great family background (or so he says), nobody seems to really know who he is. In his past, it becomes known that he stabbed his fiancé Violante (who is disguised as Sandrina), though that event is never elaborated on apart from a few snippets of dialogue, which hints that he did so because he believed her to be unfaithful. The mayor (Mathias Schulz) threatens Belfiore (Christopher Busietta). For example, when asked by the mayor, what do you say in your defense of these accusation that you killed your fiancé, he replies: "Oibò, L'amore... cio è la gelosia... fu casualità" (Alas, Love… that is, jealousy… it was an accident). In another scene, Violante (Sandrina) also says to him: “Tu senza colpa mi trafiggi, m’uccidi, innocente mi scorgi, eppur mi lasci misera desolata...” (You stab me without guilt, you kill me, you recognize my innocence but you leave me miserable and desolate). These lines show that Count Belfiore has a uncontrollable violent streak, although interestingly enough this does not otherwise manifest itself in the libretto apart from the back-story. In the script he is otherwise portrayed as being vague and confused, perhaps even a little stupid. He then “loses his mind” (interestingly enough along with Sandrina) and is seeing visions after his second act aria. You could interpret that in many ways, perhaps a modern reading could be that he is mentally ill with something such as schizophrenia. In our Augsburg production, the setting being a party at the Mayor’s house overlooking the Hollywood Hills, the Count’s state of mind is explained by the fact that he is a bad-boy type who has gone down on a self-destructive path of drugs and alcohol due to his guilt after the leaving his lover, Violante (Sandrina) for dead. Perhaps it was already there in his nature, but the situation has gotten worse. Mozart’s La Finta Giardiniera opens on Saturday 18th April 2015, 7:30pm at the Großes Haus, Theater Augsburg! Hope to see you all there! Theater Augsburg Blog - Ein Hauch von Hollywood: Theatre Augsburg's Blog entry of the sneak preview behind filming the movies used in La Finta Giardiniera. NPR Music Review: Review of a production of La Finta Giardiniera in Brussels with a great plot summary and analysis of the work.